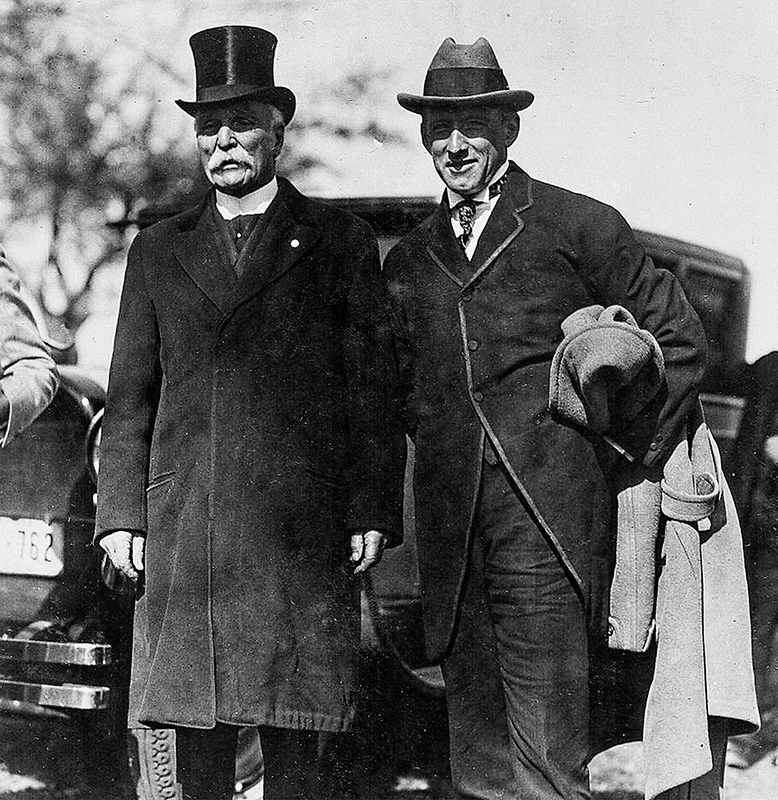 Ira Jones (left) and NH Sec of State Hobart Pillsbury, October 14, 1925, Memorial Park dedication. Hampton Historical Society photo. 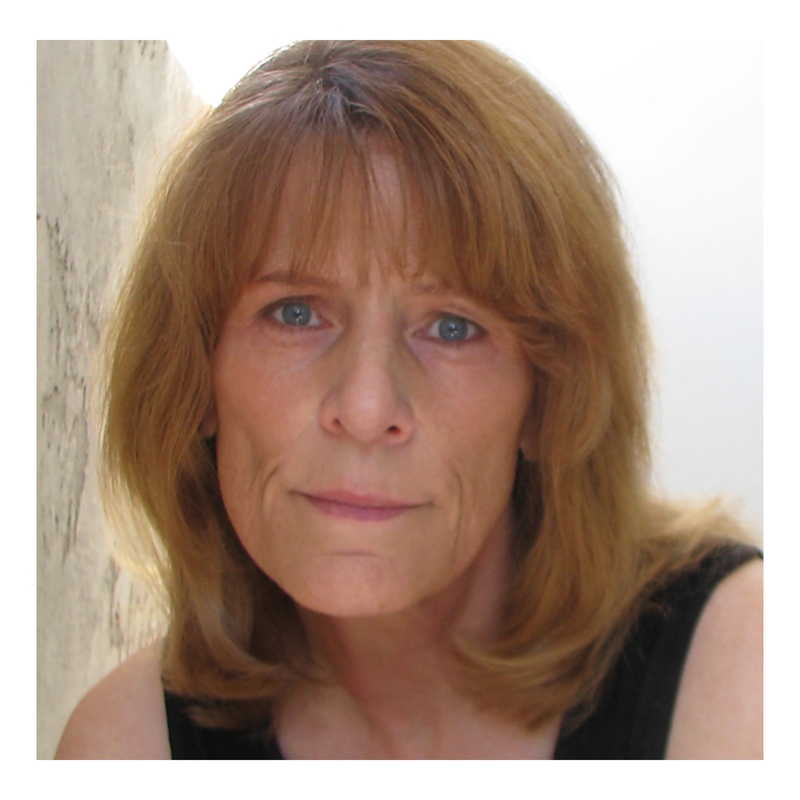 Some felt that now was the time to gather up the past before it slipped away forever. To that end, a group of civic-minded citizens formed the Meeting House Green Memorial and Historical Association, with a mission to preserve the town’s history. They built Memorial Park on the Meeting House Green and dedicated it on the occasion of the town’s 287th birthday, October 14, 1925. Attended by representatives of Hampton’s nine ‘daughter’ towns, the event was capped by the unveiling of a 12-ton granite monument honoring Hampton’s Puritan founders. 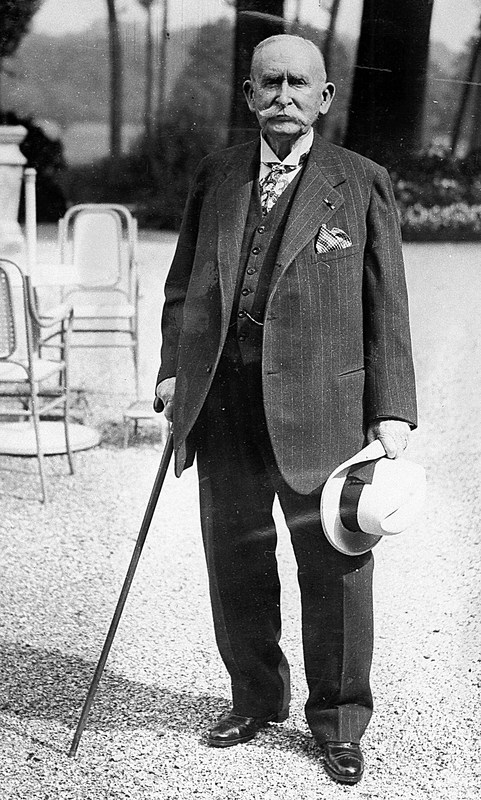 Edward Tuck in Paris. 1920s. Hampton Historical Society photo. Edward ‘Ned’ Tuck was born in Exeter in 1842. His mother was Sarah Nudd of Hampton, whose ancestors had settled here in the early 1640s. She married Mainer Amos Tuck, himself of Hampton first-settler stock, his fourth great-grandparents being the town’s first tavern keepers Robert and Joanna Tuck. A graduate of Hampton Academy and Dartmouth College, he became a lawyer, abolitionist, and congressman. His son Edward was educated at Phillips Exeter Academy and Dartmouth College. In some measure, they were adherents of Andrew Carnegie’s ‘gospel of wealth,’ and when Edward retired from banking he and Julia devoted their lives to giving away their fortune to worthy causes, with much of their philanthropy aimed at New Hampshire. Long before Edward became the benefactor of the Hampton museum that bears his name, he had given generously to his alma maters and had financed such projects as the New Hampshire Historical Society building in Concord, the Reverend John Tucke obelisk on Star Island, Stratham Hill Park, and the Exeter Cottage Hospital. He was also in the habit of donating $300 a year to his father’s old prep school, Hampton Academy. 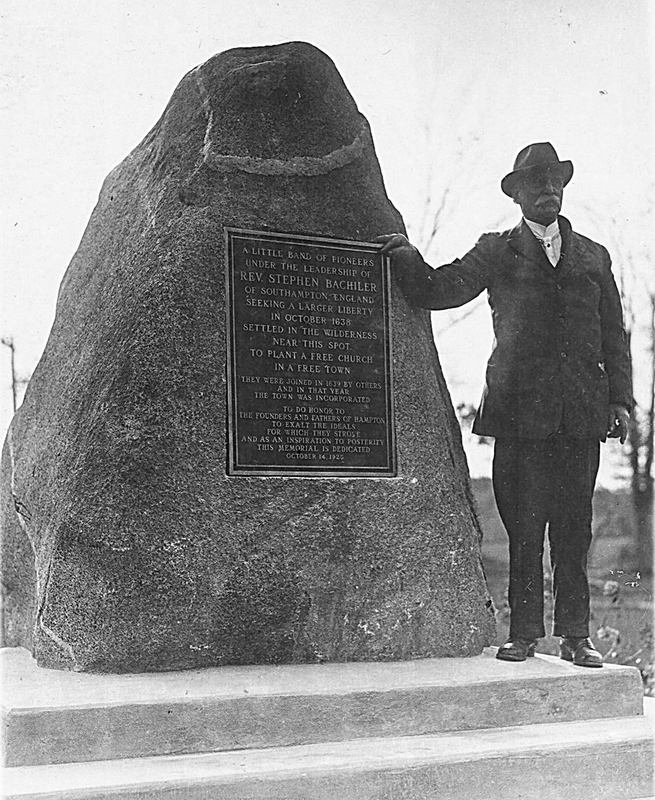 Founders Monument & Ira Jones, 1925. Hampton Historical Society photo. That man was Ira Jones, born into a Quaker family in Maine in 1836. Rejecting that creed, he studied at New Hampton for the Free Baptist ministry. When war came, he served with the 15th Maine Infantry Co. D until June 1862, when he was discharged as disabled at Camp Parapet, Louisiana. Over the years, he preached in Pennsylvania, Ohio, and every New England state. In 1901 he came to Hampton, bought a furniture and casket store, and hung out his sign as a funeral director. 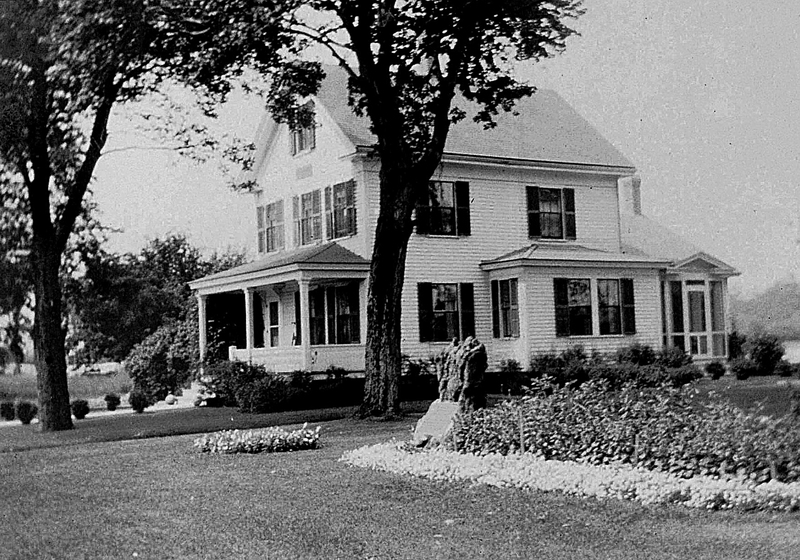 His wife Aurelia Lawrence Jones bought some nice flower gardens attached to an unspectacular Victorian on Winnacunnet Road, not far from the bramble-choked town green. The name of their new home was Roselawn, which Ira emblazoned in raised golden letters on his personal stationery. Caroline Shea tells us in her elegant little sketch that Ira ‘came to town a stranger, learned to love its beauties and know its history,’ and he ‘determined to do something to preserve the Green and honor the founders of Hampton.’ Aware that wealthy philanthropist Edward Tuck was a regular contributor to Hampton Academy, Ira solicited and received his financial backing. Ned’s first gift of $7,000 in 1925 paled in comparison to the nearly $850,000 he gave to Dartmouth College that year, but it enabled the Association to buy the farmhouse and build Memorial Park. Seven months later, in April 1927, just as his plans to build the Tuck Athletic Fields were being finalized, Ira died in his sleep. When Edward heard the news he lamented that it was ‘a pity that Mr. Jones could not have lived to see [his work] fully completed.’ He donated another $10,000, others took up Ira’s work, and the playing fields were completed and dedicated in 1930. Edward would live to see 96 years and no more, all the while continuing his financial support of the Meeting House Green Memorial and Historical Association. Tuck House, 1931. Note addition at rear with closed in porch. HHS photo. The Museum and the Association, now known as the Hampton Historical Society, together turn ninety years old this year. 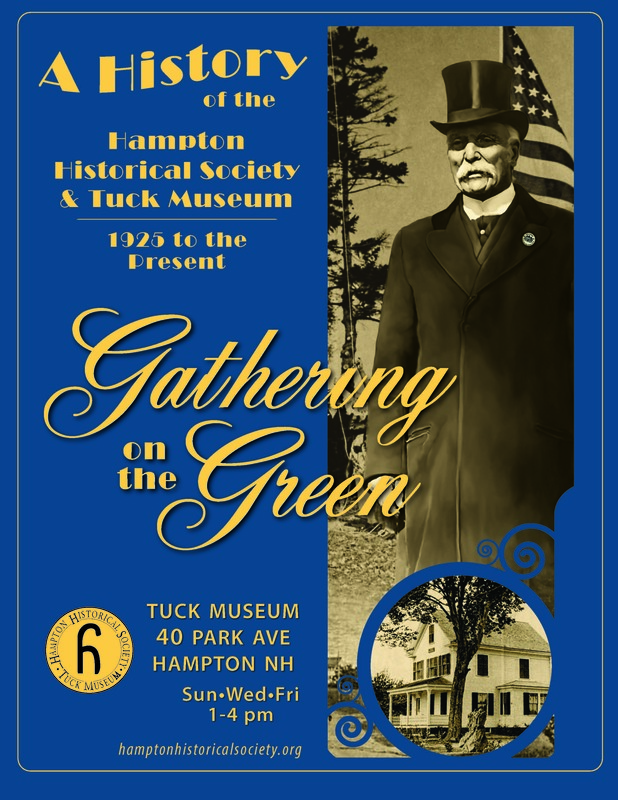 To mark the milestone, the Society has opened a new exhibit, ‘Gathering on the Green: A History of the Hampton Historical Society and Tuck Museum, 1925 to the Present, with highlights of town, beach, and national events.’ On Saturday, July 18 they’re hosting a birthday bash on the museum grounds, with appearances by Vikings at Thorvald’s Rock, the witch Goody Cole, and other things of equally special magnificence. I hope to see you there. Thanks for your excellent and interesting history of today”s Tuck Museum and Hampton Historical Society!